Caught in nets and traps or taken by hook and line, Arctic whitefish are an important subsistence food, often eaten dried or frozen. Their oil is a delicacy. Sheefish are the largest members of the whitefish family, weighing as much as 60 pounds. 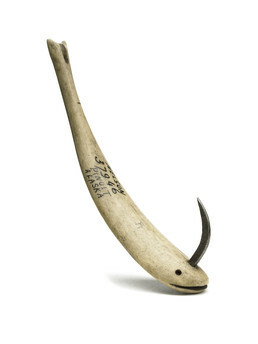 This lure for catching them is made of caribou antler, with a metal hook.